What is Koilonychia (Spoon Nails)? Koilonychia is a medical condition or disease, often termed as the spoon nails. 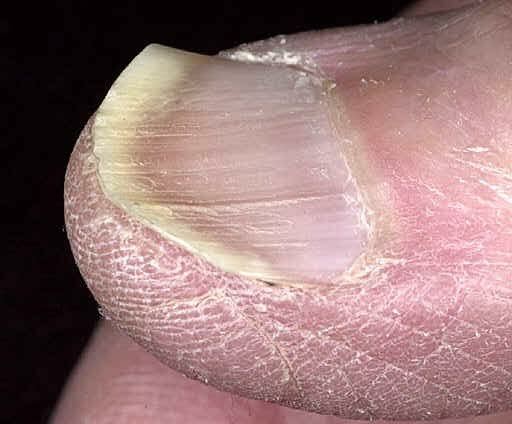 In this condition fingernails become concave shaped which further leads to the formation of a depression in the nails, giving the entire nail an appearance of a spoon. Due to this spooning, even a water droplet placed in the depression can be held there. It is often observed in infants but has a tendency to disappear with age. Koilonychia is a part of a genetic disease, termed as nail-patella syndrome. The same is characterized by various abnormalities in the kidney or the musculoskeletal abnormalities. Trauma can also lead to this condition, or it may be caused by exposure to some solvents. It has also exhibited association with chronic medical conditions. In particular, it is associated with deficiency of iron in the individual. The fingernails become thinner and eventually lift off at the outer edges. Reduced iron content in the body causes the condition and inheritance at birth is common. What is the cause of Koilonychia? Though quite rare, inherited koilonychias can lead to a middle concave depression. It is a hereditary medical condition and often indicates body abnormalities like a kidney disorder. People who have been diagnosed with cancer undergo chemotherapy and radiation therapy. Due to the effect of radiations and chemicals, people may suffer the effect of koilonychia. Deficiency of required vitamins and minerals, poor nourishment, etc. can also lead to spooning of the nails. Intestinal problems or digestive issues and even lack of proper absorption of vitamins, minerals and other nutrients by the body, can cause this critical problem. There are a number of people who might also suffer from it due to trauma or injury. Children often either develop it due to lack of nutrition or inherit it from the fore fathers. The marking feature of the disease is the spoon – like shape of the nails. The same project towards the outside at edges and get thinner. This condition also indicates the deficiency of iron in blood – anemia. Hence, curing it is easy. The nail eventually detaches from its bed. The nails take a spoon like shape. They become thinner at the center and project outwards on the edges. The outer part of the nails may become detached. Change in the color as well as the shape of the nails is observed. Pain and swelling can result from the trauma caused to the nail as well as detachment from the nail bed. In secondary infections, the nail color changes at the bottom surface. The person can look tired due to anemia. The nail surface appears very dry. This leads to easy extraction of the nail. Easy recognition of the disease can be done if change in colour of the fingernails and the toenails is observed. Even the density of the nails is affected by the condition of Koilonychia. Concave nails, thin nail plates, nails easily coming out of the nail bed are characteristics of the condition. The patient may be prescribed iron supplements and a gluten free diet to resolve anemia and normalize levels of the anti – tissue transglutaminase antibody. Curing the anemic condition as a cause of Koilonychia is quite easy. Suitable iron supplements are prescribed by the doctor after checking the iron profile. A dietitian can be consulted to work out a food chart, including iron supplements and vitamins. The beginning of the treatment is by covering up the iron deficiency with oral pills. Specific care needs to be taken, to avoid an overdose, though. Functions of the digestive system are also checked to ascertain the complete absorption of nutrients by the body. Skin softening creams and lotions may be used. These can be used after washing and bathing. They prevent loss of moisture from the skin and nails. Therefore, preventing the drying of nails. The condition needs to be treated immediately, upon recognition. The iron supplements prescribed must be taken 30 minutes prior to meals. These must not be consumed with drinks like coffee or tea, which can inhibit the absorption of iron by the body. Also, iron overdose can even prove to be fatal, besides causing other problems. Hence, the iron intake must be strictly as per the doctor’s prescription. In case abnormalities such as ingrown toenails are observes, try to avoid wearing shoes that crowd the toes together. This will prevent the ingrowths and shock to nails, which can lead to Koilonychia. When working with harsh chemicals or detergents, prefer wearing gloves. These chemicals can cause trauma to the nails, leading to Koilonychia. The deficiency of iron further leads to the deficiency of enzymes which require or contain iron. This leads to spoon nails or Koilonychia. The treatment therapy of iron deficiency anemia is dependent on the severity as well as its cause. Dietary changes, medicines, supplements and surgery can all be part of the treatment. Severe deficiency of iron can require iron injections, blood transfusion or even IV (intravenous) iron therapy. Absorption of iron in the body is aided by vitamin C. Vegetables and fruits are excellent sources of the vitamin. Especially, the citrus fruits, like tangerines, grapefruit and oranges have Vitamin C in plenty. Kiwis, cantaloupes and strawberries are also rich sources. Prefer fresh fruits over canned fruits due to the higher percentage of the vitamin in the former. Vegetables like broccoli, cabbage, tomatoes, peppers, potatoes, Brussels sprouts and green leafy veggies like spinach are good sources too. Grapefruit can affect strength and effect of certain medicines. Hence, consult the pharmacist or doctor if you’re on medication. If the iron deficiency anemia and Koilonychia are caused due to blood loss, treatment will rely on the cause of bleeding. Bleeding ulcers are usually taken care of by antibiotics, for example. Surgery is required for intestinal bleeding caused by cancerous tumours or polyps. Birth control pills help in regulating a heavy menstrual flow. Transfusion of red blood cells is advised for severe cases. It requires careful matching of blood and use of sterilized instruments. This method is a rapid treatment for iron deficiency. The RBC’s are an iron source which is never refused by the body. However, it is a treatment for a short term and must be complemented with proper nutrition and iron supplements. Injection of iron into the muscles or an intravenous line (IV) of the individuals’ blood vessels is also a treatment for severe iron deficiency anemia. Yet, it has a number of safety concerns tagging along. It requires skilled staff and is given to individuals with long term iron requirement but, unable to consume pills. A mild problem can be easily taken care of, at home. These home remedies promote nail growth and help get rid of spoon nails. Keeping the hands as well as toe nails clean on a regular basis takes the chances of getting a disease, a notch lower. If Koilonychia is an after effect of another disease, curing the root cause is necessary. Lack of iron content, as discussed is the most common cause of Koilonychia. You must monitor your iron intake and consume iron rich foods like broccoli, spinach, sea food, meat, chicken, kidney beans, tuna, shrimp, tofu, lentils, etc. Drink milk regularly. It is not only a rich source of calcium, but has high iron content too. Biting nails and fingers is a common cause of Koilonychia. You must stop immediately. In order to get rid of the habit, you can wear rubber gloves or apply clove oil to your finger tips and nails. Caffeine decreases iron absorption by the body. Consumption of coffee, tea and other caffeinated beverages hence should be reduced in our daily routine. The consumption is often a follow up of stress, lack of sleep or sheer habit. Whatever the reasons, individuals must reduce the consumption, especially, if suffering from Koilonychia. A balanced diet must be promoted and encouraged. Vitamins and minerals help in iron absorption and also in preventing as well as curing other diseases causing Koilonychia.